I got a request for a post about the bread I have been baking. I aim to please, so here it is. 2010 is the year of bread here on the hay farm. For Christmas, the Texan gave me Artisan Bread in Five Minutes a Day. To date, I have baked 8 loaves from 3 different recipes: the master recipe, challah, and bran. I also have a batch of the oatmeal bread waiting in my fridge. 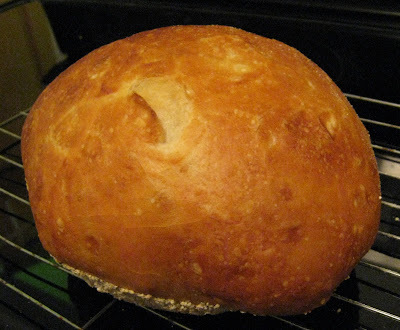 Here is the first loaf of artisan bread that I made- ever. Not to brag on myself, but I was amazed. This is the type of bread that I am always looking for in our little town. I figured it had to be really hard to make, or someone would be selling it. It's not hard though. Not hard at all. But first, about this bread. It has a chewy crust! For me it is all about the crust. The interior isn't fluffy like the white bread style 'Italian bread' that is sold around here. But it isn't dense and heavy like I expected my first attempts to be. A little bit about technique. (You really should buy the book, you will save enough to cover the cost by not buying expensive bread anymore.) The basic premise is that you mix a large batch of a wet dough that will keep in the fridge for a while- some recipes up to two weeks. Because it is a wet dough, it doesn't need to be kneaded, just stirred together. When you are ready for some fresh bread all you need to do is pull out some of the dough, shape it, let it rest a while and then bake it. 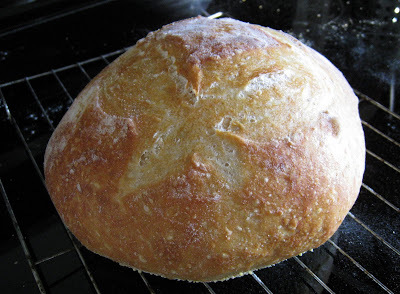 The great crusts are created by baking on a stone and introducing steam to the oven. In the morning, I can shape some dough and let it rest while I eat breakfast. Then, I bake it while I finish getting ready for work. I leave it to cool on a rack while I am at work. 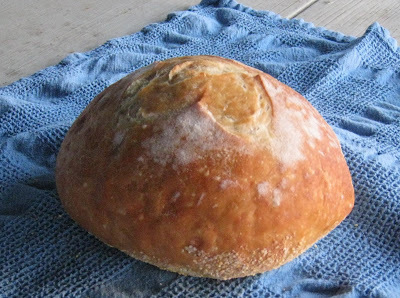 When the Texan and I sit down for dinner, we have fresh bread, made that morning. I have been doing this pretty consistently since the new year and I think the small amount of time and effort is worth the reward. This is the challah that I made. Yes, I realize that I only put poppy seeds on half. The Texan wasn't sure if he liked poppy seeds, so I was trying to be diplomatic. I think I should have let this batch rest just a few minutes longer before I baked it. It was delicious, just a little denser then I think it was supposed to be. 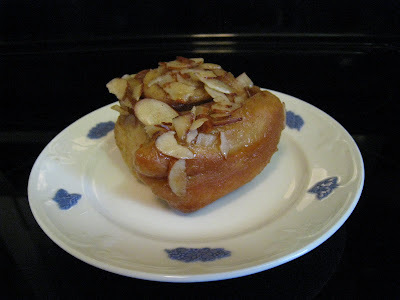 The main reason I made the challah dough was to try out the recipes for some sweets. These sticky buns were delicious. I made them with almonds instead of the pecans that were called for. I didn't have any pecans in the house, but I like almonds better anyway, so it worked out. These weren't overly sweet. I might add a little more cinnamon and nutmeg to the nut mixture that gets rolled inside. I also made a turban shaped challah that had dried sweetened cranberries in it. I gave it to a family member, so I didn't get a chance to taste it. I sure hope it was good. I don't have any great photos of the bran recipe. It is very similar to the master recipe, just with some wheat bran added for fiber and flavor. I liked this recipe, partly because I knew it was healthier then the all white flour master recipe. For the record, the Texan likes the master recipe best. That is the amazing thing about Artisan Bread. Three weeks ago I was intimidated by yeast recipes, and now I feel confident enough that I am going to experiment. I'll keep you up to date with these experiments. Fantastic looking bread! I am hungry looking at them. Please keep up the good work and let us see more pics to get us through the day! Loving it! Jay R- Once I make a successful sandwich loaf, I promise you guys will get some.